No bones about it, Happy Physical Therapy (PT) Month! This October, we are honoring physical therapists and all of their glory as valuable assets to the rehabilitation world. Physical therapists are exceptional members of the healthcare team, yet their role is sometimes misrepresented or narrowed. In celebration of physical therapy month, we at NGOT aspire to bust up common physical therapy myths! Do you really know what physical therapists do? So you think you know what physical therapists actually do? Most individuals in the general public will probably have a broad understanding of what physical therapists actually do. However, it is likely that the overarching view of physical therapy is strictly working with orthopedic conditions. Busting common physical therapy myths. Myth: A physical therapist’s main role is to be a patient’s personal trainer. Although some patients may agree to this statement, a physical therapist’s main role is far from just leading a few passive exercises and providing a generic home exercise program. In fact, these healthcare professionals utilize evidence-based based skilled services that “prevent, minimize, or eliminate impairments in the body functions and structures in effort to enhance optimal human performance and improve overall quality of life”. While each patient presents with a unique set of individual needs, a physical therapist will utilize a variety a treatment techniques which include providing skilled functional movement training, designing tailored sets of corrective exercises, training patients and family members on safe use of mobility equipment, performing soft tissue massages, teaching pain management strategies, and using many other techniques utilized to care for each patient. Myth: Physical therapists only work in outpatient rehab centers. Myth: Physical therapy can replace occupational therapy. No way! But we are definitely better together. For example, you need to be able to walk to your closet to retrieve your clothing without losing your balance… and you can’t (shouldn’t) walk around naked! We have to work together as a team and knowing each other's strengths is vital to the relationship. Check out what our physical therapy friends think of OT. Myth: Physical therapists can only work with athletes and patients with musculoskeletal needs. Myth: Physical therapists have a hard time finding steady jobs. Eh, false! According to the Bureau of Labor Statistics, physical therapists are not going anywhere. In fact, the job outlook for PTs is expected to grow 34% (much faster than average) from 2014-2024. Myth: Physical Therapists exist solely to watch you walk. Yes, we all know that physical therapists are obsessive-compulsive in measuring the exact feet that you walked from and become all too giddy when a patient walks their furthest distance. But there is more to it than walking. Physical therapists assess a patient’s gait, cadence, motor control, and a multitude of other objectives that occur during the phases of gait in an effort to conclude how to guide an intervention plan to improve a patient’s walking pattern. Myth: Physical therapists can only work on improving lower body motor function. Physical therapists do not work on the upper extremities. We at NGOT don’t claim to know everything, but last time we checked it is nearly impossible to utilize most adaptive mobility devices (front wheel walkers, standard walkers, quad canes, etc.) without some sort of functional training of an individual’s bilateral upper extremities to safely manipulate the device before attempting ambulation. Myth: Physical therapists put their patients in pain. Well, yes, sometimes physical therapy is painful and has been jokingly referred to "physical terrorists" or "physical torture". But, according to the Centers for Disease Control and Prevention (CDC) in 2016 physical therapy was identified as part of the solution towards pain relief as an alternative to opioids. Myth: Physical Therapy is monotonous. The short answer to this myth: no. This profession is far from boring! 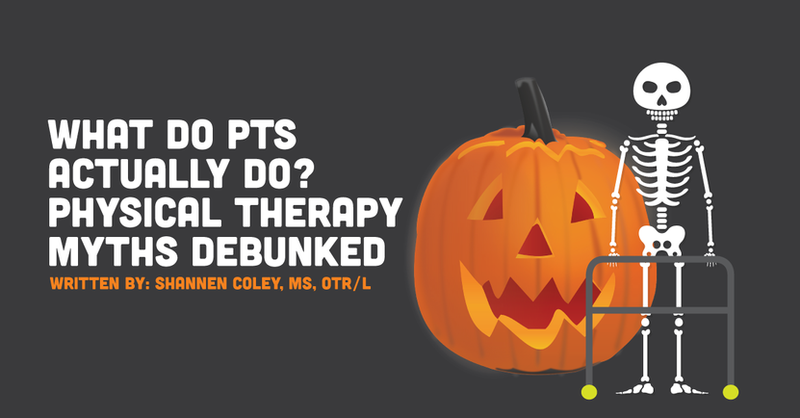 Like previously mentioned, the PT world has a lot to offer in a multitude of settings and patient populations. If you are seeking adventure and need a change, then venture out into exploring nontraditional PT routes including pelvic floor therapy, vestibular rehab, marketing roles, a multitude of clinical roles, and management. Now that we have cleared up some physical therapy myths, let’s join forces in celebration! After all, who doesn’t like an excuse to celebrate with pizza parties? National Physical Therapy Month is an excellent opportunity for PTs and their beloved therapy counterparts (occupational therapists and speech-language pathologists) to go out into the community and raise awareness to educate the public on the significant role that physical therapists play in regards to improving mobility and strength, restoring function, and managing pain.